Get £30 off your first order at Glasses Direct with our referral link code. Click ´Get Deal´ to get to the referral page. Enter your email address and then click ‘Get £30 off Frames’ to get started! Once you’ve bought your first pair of glasses, why not treat a friend or family member to a discount too? Invite people to get £30 discount off their first pair, and you’ll be rewarded with a £15 Amazon.co.uk gift card for every referral! Finding the right pair of glasses is so important, since they’re worn on your face all day. With so many factors like price, fit, comfort and looks to consider it can be difficult to find a decent pair that ticks all the boxes. 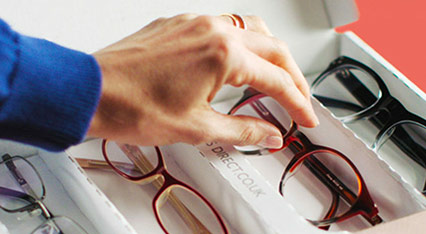 That’s where Glasses Direct comes in; they want to provide great looking and great fitting glasses at affordable prices. What’s more, since they’re an online retailer they offer a unique solution to the problem of buying glasses online. With a Home Trial service where you can try on frames at home for seven days before you decide on a purchase, or the Virtual Try-On service allowing you to try on frames virtually, Glasses Direct want to ensure you find the pair best suited to you. With a high score of 9.4 on Trustpilot, rest assured you can shop with ease at Glasses Direct. New customers only. No voucher code necessary.